Champaign, IL popped the cork on a new farmers market in 2015, so this week, we are going to peek into their great year via a Guest Instagram throwback-takeover! Champaign Farmers’ Market’s manager, Sarah Simeziane, spoke with FMC about their great season. Sarah Simeziane: We’re very excited to share the creative ways we marketed our first season. An inaugural season is tough to pull off, and ours surpassed all expectations. Non-stop marketing all season was definitely the secret, and we hope everyone will appreciate what we did! We’d also like to share some of the challenges we faced implementing a new market, with the hope that our experience can help other young markets succeed. Farmers Market Coalition: Give us a little history about your market. Sarah Simeziane: The Land Connection launched the Champaign Farmers’ Market in 2015 in order to provide a mid-week sales opportunity for local farmers, , and help make fresh, local food more accessible to nearby Champaign neighborhoods classified as food deserts. Since 2001, The Land Connection has provided farmer training courses and workshops, and the market was conceived as another way to connect the community with local food production, as well as support new and smaller farms by focusing just on food and putting vendors on a more equal footing, so that new farmers can gain more visibility on the local food scene. Our market focuses on food and farm products (such as wool or soaps/lotions made from goat’s milk raised by the vendor). Because of our focus on supporting farmers, we aim to reserve as much space as possible for produce, meat, and dairy, so we limit value-added products to 20% of vendor lineup. Everything sold at our market needs to be grown, raised or produced by the vendor within a 150-mile radius of Champaign-Urbana. We made one exception for an exciting Illinois program operated out of Galesburg, called Sitka Salmon Shares, whose mission aligns with our own. Sitka works with fisherman in Alaska and has created a CSA for sustainably sourced wild Alaskan salmon and other fish. 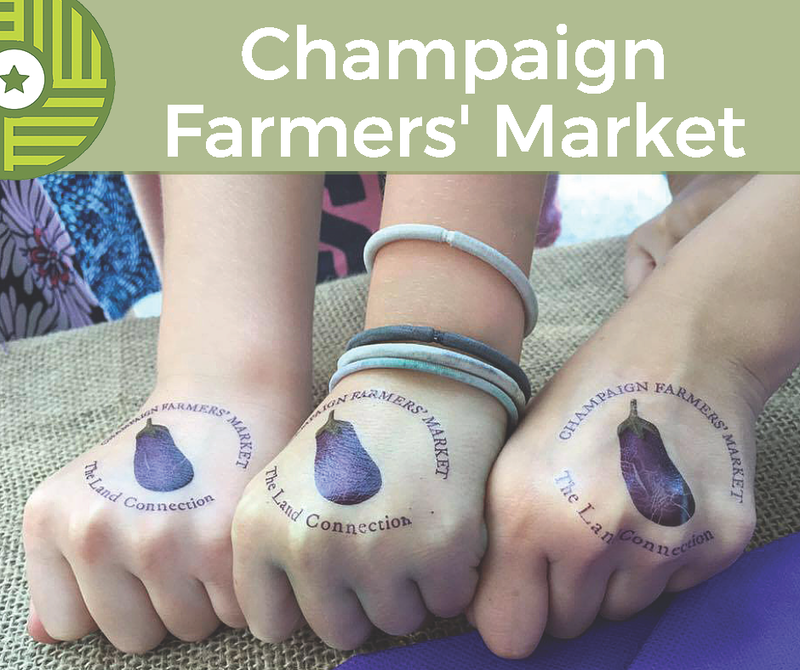 The Champaign Farmers’ Market offers a wide variety of produce, as well as meat, honey, award-winning goat cheeses, bread, bagels, and pastries, cupcakes, macarons, flowers, plants, iced coffees and teas. Our vendors also offer services, such as knife-sharpening and participate in demonstrations on topics such as cut-flower arranging and custom farm tools. During the initial planning phase, we hoped to get about 10-15 vendors per market, however recruitment efforts resulted in 17 on opening day, with an average of 18 vendors per market across the whole season, and 20 per week in peak summer season. The market is managed by paid Land Connection staff, assisted by volunteers on market day. Farmers Market Coalition: Describe your market. Sarah Simeziane: The Champaign Farmers’ Market is an outdoor market that runs from May through October in downtown Champaign. Our market vibe is fun and playful; we work to create an atmosphere that families will enjoy. The market occupies half of a downtown parking lot, with office and residential buildings on either side, numerous restaurants and cafes just down the street, and the Orpheum Children’s Science Museum at the other end of the lot. The buildings provide much needed shade for hot summer afternoons, but the shade comes at a price: wind. Our market site is always a bit blusterier than elsewhere in town, but we make do (and we love those breezes in the dog days of summer!). Farmers Market Coalition: How do you generate neighborhood excitement for your market? Sarah Simeziane: We’re proud of our family-friendly atmosphere. Every week we set up our “kids’ table” with chalk, jumpropes, bubbles and hula hoops, where children can play safely while their parents shop. We’re also joined by the Orpheum Children’s Museum once a month with interactive educational kids’ activities. We also hand out free reusable shopping bags and our very popular market eggplant temporary tattoos. Local musicians are also on hand, as well as enterprising youngsters who offer face painting and balloon animals. Increasing access to healthy food for underserved neighborhoods is another driving force behind the market. Several of the neighborhoods just to the north of downtown Champaign are classified as food deserts, and we built up a fund to double SNAP purchases at the market, providing up to $20 per week in matching funds to SNAP recipients. We also provide recipe cards to provide ideas on how to use unfamiliar produce and are regularly joined the University of Illinois Extension’s SNAP education program with food demonstrations and recipe ideas. We set up a Community Tent next to the Land Connection’s own booth, where local organizations can promote upcoming events, fundraising efforts, or simply inform the community about what they do. Organizations ranged from the City of Champaign to the Illinois Stewardship Alliance to the Parkland College Science Club. Community groups held aerial yoga demonstrations, busted out an accordion to promote Oktoberfest, and offered nutrition scavenger hunts for kids. From the start we’ve also worked hard to incorporate a strong educational component, tying in to the Land Connection’s farmer training mission. We’ve worked with vendors on demonstrations to give the public a taste of our upcoming workshops and pique their interest in farming (or at least in growing their own produce). We’ve also hosted a number of events, such as our French-themed Bastille Day at le Marché, National Farmers’ Market Week celebrations in conjunction with the Saturday morning Market at the Square, one of Illinois’ largest farmers’ markets, located in neighboring Urbana, and our Ugly Produce Beauty Pageant, where shoppers voted on their favorite funky looking vegetables discovered by our vendors. Farmers Market Coalition: How has social media and other marketing methods worked for promoting your market? Sarah Simeziane: From the start social media has played a large role in our promotion. We regularly post market images on Facebook, Twitter and Instagram, and we’ve also developed activities to encourage our patrons to join in on the fun. We created our Market Haul Photo Booth, where patrons can artfully arrange their purchases and post them to social media. We’ve incorporated the Photo Booth into several photo contests and giveaways throughout the season. After seeing the success of our fellow local farmers’ market in Urbana with their rooster mascot, we adapted our eggplant logo into a mascot (known as Monsieur Aubergine after the Bastille Day festivities) who gets new costumes and photo ops around the community for different events. Farmers Market Coalition: Did we miss anything? Sarah Simeziane: We love puns. Probably too much. So enjoy our radishing collection of photos!